Food is a bridge across cultures and generations, something that all people share. It nourishes us, comforts us and provides the background to some of our most important milestones. But somewhere along the way, our relationship to cooking changed, influenced by the machinations of a more industrialised food industry and we became alienated from the origins of the ingredients we use. Pure is a return to basics, treating food simply to preserve the qualities of the core ingredients, bringing their natural flavours to the fore. It’s about being discerning with what you eat, picking the best of what you can afford and treating it with the respect such produce demands. These recipes are a celebration of food, a return to a more simple approach of cooking that supports the wellbeing of all. 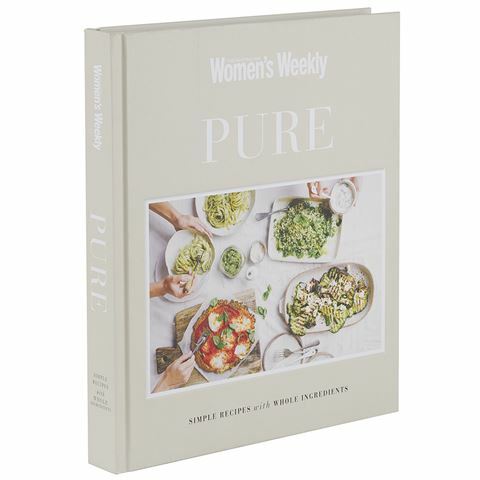 Filled with dozens of delicious recipes from the Australian Women’s Weekly. Focuses on simple, uncomplicated recipes that showcase the natural qualities of your ingredients. Recipes are divided into chapters – Eggs & Dairy, Grains & Pulses, Fruit, Vegetables, Meat and Seafood. Beautiful photography throughout by Ben Dearnley. Begins with an introductory chapter on a simplistic approach to cooking. Glossary, conversion chart and index at the back of the book. Dimensions: 24.5cm (l) x 28.8cm (h) x 3.3cm (w).